The ladies over at SITS asked their readers to write a series of posts about Halloween. Today's topic is "Creepy, Crawly Creations." A Canon Rebel T2i camera is up for grabs. You know me. I cannot resist a challenge that comes with a prize. I like to think of myself as crafty. I'm no Martha Stewart, but I do alright. Certain holidays inspire me to get jiggy with my glue gun. I look forward to decorating for Halloween the most. I want my decorations to send a message to all the neighborhood kids that our home is cool and has the good candy, but have you seen what retailers charge for Halloween decor? I simply spread the cobwebs across the large spider web and then sewed on a few fake spiders...very easy and the result is spooktacular! 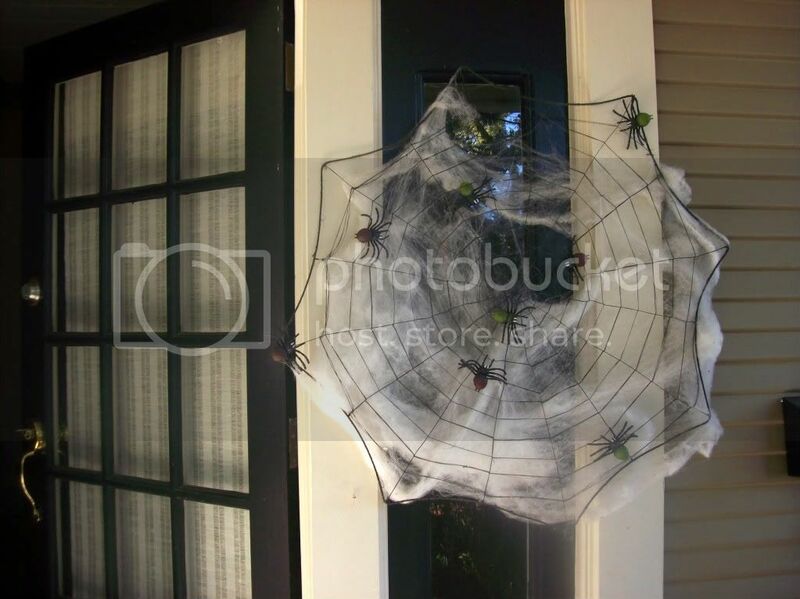 I think my creepy, crawly spider web is going to amuse the trick or treaters when they reach my door. Don't you agree? That looks great! It would be one of those things though, that winds up startling me for months after Halloween is over! Happy Halloween. Eeewww....I would not want to approach your door, even if I KNEW that was fake! I hate spiders!!! I hope you are having a great weekend! I have missed talking to you lately, but I think of you often. I am so glad this isn't real. Those spiders are huge.